Discos en vinilo y CD de Disco Bits. 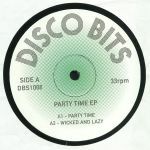 Review: Those who remember the first wave of funk breaks mash-ups and floor-filling hip-hop cut-ups in the late 1990s should be aware of J-Large; the mysterious DJ/producer has been remixing and reworking tracks (most notably by the Herbaliser) on and off ever since. 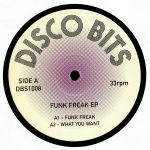 His latest 7" escapade is suitably sizable, with A-side "Get Your Own" fusing Christina Aguilera's best-known vocal with loops and grooves lifted from a certain horn-toting jazz disco-funk classic. 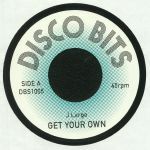 On the flip you'll find "J Zimbra", a bustling and floor-friendly tool-up of heavyweight Afro-funk slammer from 1979. As you'd expect, both are guaranteed to get the party started... and then some.